Synopsis: Headless horsemen were staples of Northern European storytelling, featuring in German, Irish (e.g. Dullahan), Scandinavian (e.g. the Wild Hunt) and English legends and were included in Robert Burns's "Tam o' Shanter" (1790), and BUrger's Der wilde JAger, translated as The Wild Huntsman (1796). Usually viewed as omens of ill-fortune for those who chose to disregard their apparitions, these specters found their victims in proud, scheming persons and characters with hubris and arrogance. The chief part of the stories, however, turned upon the favorite specter of Sleepy Hollow, the Headless Horseman, who had been heard several times of late, patrolling the country; and, it was said, tethered his horse nightly among the graves in the churchyard. The story was immediately matched by a thrice marvelous adventure of Brom Bones, who made light of the Galloping Hessian as an arrant jockey. He affirmed that on returning one night from the neighboring village of Sing Sing, he had been overtaken by this midnight trooper; that he had offered to race with him for a bowl of punch and should have won it too, for Daredevil beat the goblin horse all hollow, but just as they came to the church bridge, the Hessian bolted, and vanished in a flash of fire. All these tales, told in that drowsy undertone with which men talk in the dark, the countenances of the listeners only now and then receiving a casual gleam from the glare of a pipe, sank deep in the mind of Ichabod. About the Author: Washington Irving was an American author, essayist, biographer and historian of the early 19th century. He began his literary career at the age of nineteen by writing newspaper articles under the pseudonym, "Jonathan Oldstyle." In 1809, he published, The History of New York, under his most well known public persona, Diedrich Knickerbocker. Irving is best known for his short stories, "The Legend of Sleepy Hollow" and "Rip Van Winkle" both of which appear in his book, The Sketch Book of Geoffrey Crayon, Gent. which he published in 1819. Irving's historical works include a five volume biography of George Washington (for whom he was named after) as well as biographies of Oliver Goldsmith, Muhammad, and several histories of 15th-century Spain dealing with subjects such as Christopher Columbus, the Moors, and the Alhambra. Irving felt a strong connection to Spain and was appointed by President John Tyler to serve as the first Spanish speaking U.S. minister to Spain from 1842 to 1846.
Review: I first read this book when I was...young. I want to say 8 or 9. I had seen Disney's Ichabod cartoon, and when I learned that it was based on a book, wild horses couldn't keep me away from it. 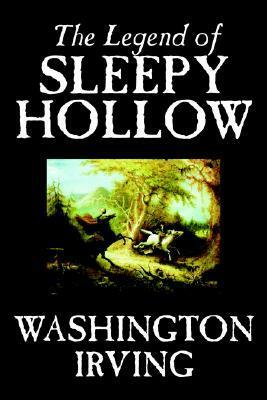 Or the nightmares that were promptly introduced when I found out there was a REAL Sleepy Hollow in New York (been there outside the Halloween season, it's gorgeous and the cemetery is beautiful!). I still love the story, and try to re-read it when I can. This is the quintessential spooky story, and if you've seen the movie or the cartoon and haven't read the book then go pick this up now before the Headless Horseman chases you down!